Okay, let's get a few things out of the way. I wasn't kidnapped. I was in the mountains of NC and my blackberry died. (Sorry, I should probably come up with a more entertaining excuse, but the truth will have to do for now.) As for the Shadow City Store, I closed it because I ran out of shirts just when my printer's machine decided to break! I'll try to have some cool new ones available before the next book is out! Now. Time for a little controversy. A cash-strapped middle school in NC was recently in the news for all the wrong reasons. Seems the school's principal decided the best way to raise a little money was to sell grades. That's right. For a 20$ "donation," a student would be given 20 points which he could apply to his test scores. Wow. That's wrong for so many reasons that I couldn't even begin to count them. Though I do feel sorry for the school. Read more here. Here's a story that's a little more complex. A teacher in Minnesota apparently broke the law by posting the names and grades of students who scored the highest on a recent test. He only wanted to reward those who did well and motivate those who didn't. But a parent complained that it was a violation of her son's privacy. Was it? Should posting the highest test scores be against the law? (Keep in mind--he didn't post the names of those who hadn't aced the test.) Read more here and let me know what you think! Hahahaha, I love that picture! Can't wait to see the new shirts. The parent who complained is completely ridiculous. SUCH PARENTS ARE THE REASON CHILDREN TODAY ARE NINCOMPOOPS. Which kinds of reminds me, today our headmistress came to our year's common room, gave us a long speech about respecting each other, each others' property, and our "right to learn," and conducted a search of all our bags, lockers, and bedrooms (without our consent! ), and threatened to call the police - all because some girl's BINDERS are missing! I can understand if it were a diamond ring but they told us the contents of the binders were all replacable... she treated us as if were all criminals (even though the binders were probably just misplaced and everyone in our year is friends with each other...). she actually said, "Whichever one of you did this should feel really screwed up inside right now, and if not there is something VERY WRONG with you and you should see a counsellor. The rest of you girls too, even if you haven't done anything wrong, should be feeling very screwed up inside as well." I have no words ._. Hmmm. According to my math grade I would never be on that list. It's funny how living in a different culture can change your perspective on privacy. We lived in Minnesota with our four children until August, when we moved to Spain. I can definitely see a Minnesota parent complaining about such a thing. But here in Spain? The teachers read each test score aloud as they pass them back. Not only that, but my daughter always gets the top math score in her class, and her math teacher shows her tests to all the other teachers! They are always congratulating her, which is nice, but not exactly PRIVATE. ThumbBiter: The headmistress is the one who needs counsling! Wow. So, so wrong. No, I'm talking about the Minnesota school...I agree with you though Sensei. o my gosh that picture has solved so many of my math problems. In my mind that is the only logical answer to that question. What does it MEAN?! Well where I live they post honor and high honor roll students in the newspaper. I mean I guess somebody might have an issue with it, but I don't think it's that big a deal unless you're super modest or something. Just today I was actually thinking about this very thing. As I passed the office, I heard the lady there say "hey somebody got everything right on their math SAT!" I think some students in there were asking her who it was. I get pretty good grades, and I wouldn't care if my teacher posted them up somewhere. You could make a t-shirt with the Irregulars' logo on it. You made that suggestion once when you did that post of silk screening t-shirts. i have aalso seen that picture every where, but i still love it <3 as for the school selling grades, could they really be that desperate!! honestly there are better ways, like maybe having a bake sale or car wash like other schools! and the other story is wierd because my math teacher does the same thing with no problems. and btw i have varsity try outs for my school tomorrow :/ so nervouse wish me luck!! My maths teacher actually starts the whole statisitics show by drawing a box and whisker plot, working out the average, median, mode and once even a cumulative frequency graph so we can get an idea of how the whole class performed, before getting our own test scores back. Also, just recently, every student from my whole year level had their mid year exam marks averaged then ranked, 1 being the best. I think for each person, motivation is done differently. One student might like to know where they stand in rankings of test scores, etc... so that they can improve, whilst another student may just loose self esteem and perform even worse on tests/examinations. And how about Iris? When will she be shown with the other Irregulars? CLAIRE: I have a common room 2 but it isn't like Harry Potter (darn) it's just a boring old room. I hope you had a nice time! First of all, the point of giving grades is to test what the student learned. Grades have no meaning if you buy them instead of earn them. I fell sorry for those kids if that’s what their principal is teaching them. You, autherous of the famous Kiki Strike series, are killing your loyal fans. PLEASE tell us when book three is coming out!!! 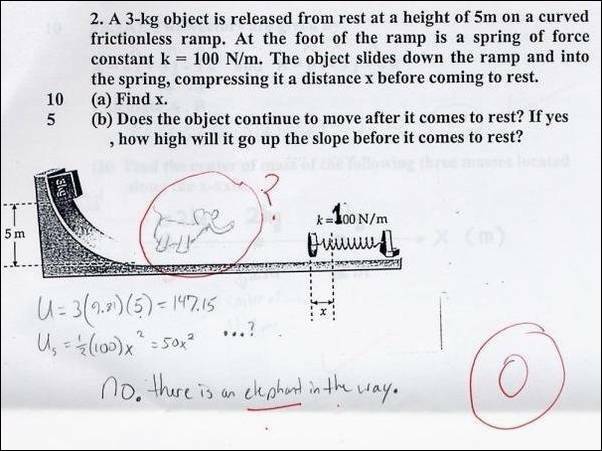 my math teacher last year would have given me half credit for the elephant, he loved me. My teacher would flip out and tell me "This is a high school course. You have to be responsible!" she doesn't get that were still in 8th grade. She scares me!!! Anyway, that principal is clever... a little scandelous, but clever. But that was still the wrong thing to do. Our teachers put up our papers with 100%s all the time. I hate it when parents complain, especially about nothing. I don't know how many times it's gotten me in trouble... when I wasn't really doing anything! Don't get me wrong, I adore my parents... but other people's... not so much. I definately vote that it should not be against the law. Ok so some stupid girls when i was in third grade started wearing PAJAMA PANTS to school. Like the whole day. Next year you had to buy a certain type of pants for like 25$ bucks! Just to wear under our skirt! But of course I got a cheapo pair that looked exactly the same for 10$. They also had to announce to the whole school how some people were destroying desks by writing all them blah blah blah and that we have to have assigned seats now. I HATE MY SCHOOL! Love the picture though. Gonna save it to the files. that's not fair because i try to get good grades and the kids who don't try just get an A handed to them. that's a scam! Have you ever seen Monty Python's flying circus? There's one where a resteraunt just serves spam and whenever anyone says spam some people sing 'spam,spam,spam, SPAAMM! and Reel dancer reminded me of it. Scam,scam, scam, SSCCAAMM!! P.S. Are you sure you weren't abducted by aliens? I get pretty good grades, but it makes me uncomfortable when my teachers display my grades (revealing my hidden genius, don'cha know). But I just tell my teachers that, and they don't do it again. I don't think it's a big enough deal to have a parent interfere or make a law preventing it. As for the posting of grades online- my school, like most, has an All A honor role, which is a bit like posting the test scores, but no one ever gets in trouble for that, at least to my knowledge. But I really hate that "Everyone's a winner" thing- There ARE losers, so why not commend the stronger people while helping the weaker to succeed? Ok, the mother in Minnesota was right, posting names and grades like that is a direct violation of FERPA (Family Education Rights and Privacy Act). Now whether or not it should be illegal is up to debate, but the fact that is is illegal isn't. Also, it's a Federal law, so it's illegal everywhere in the US. Personally, I'm glad it is. When I was in elementary school (before FERPA was passed) my teachers would always write everyones test grades on the board so we knew how everyone else did. I was always on top and was bullied because of it. Life would have been much easier if my entire class didn't know about my good grades! School Principales=corrupt. Really sad... I can't stand my school principle. Everybody: I agree! Parents who are always whining are really annoying. There's nothing wrong with complaining about something important, but parents just whine... about things they could have handled on there own. My school gets swormed with scary moms all the time. Well in my science class, my teacher just asks us if we wants our grades read aloud one by one. My friend one time didn't want hers to be read but the teacher said that it was really good and read it anyway. I would have no problem with that, especially if it was a good grade, but my friend felt differently, and was mad that the teacher read it. 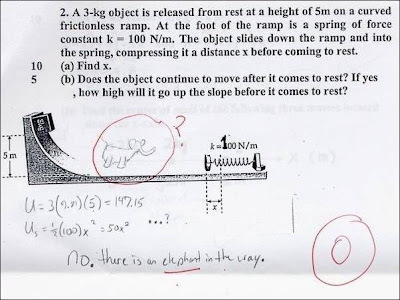 I actually think that's Physics, not math, because they mentioned friction, and its about motion and stuff. In my class we have a board of all our good grades. Since like 10 people didnt have anything to put up, My teacher put up art projects. And now my art project has a hole on the top. Haha, the picture reminds me of The Mysterious Benedict Society. Good book, though not as good as Kiki Strike. Hello Ananka, Kiki and all the Irregulars! I'm from Portugal and I love to read you adventures in your books! The Shadow City is awesome! I think it's not right, personally. I mean, if you find out who isn't posted, you know who didn't ace the test, so really, it's just as bad as posting the ones who didn't ace the test. Agree? And What Did They Do With the Bus Driver? Which Cake is More Terrifying?